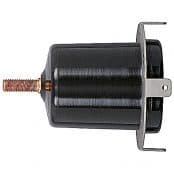 Thorne & Derrick distribute Elastimold Elbows to provide a convenient method to connect and disconnect cables and terminate equipment on MV-HV power distribution systems. Elastimold Separable Connectors have been designed and tested per IEEE 386 Standard For Separable Connectors. Products are designed and constructed for all applications including padmount, subsurface, vault, indoor, outdoor, direct sunlight, direct buried and continuously submerged in water. 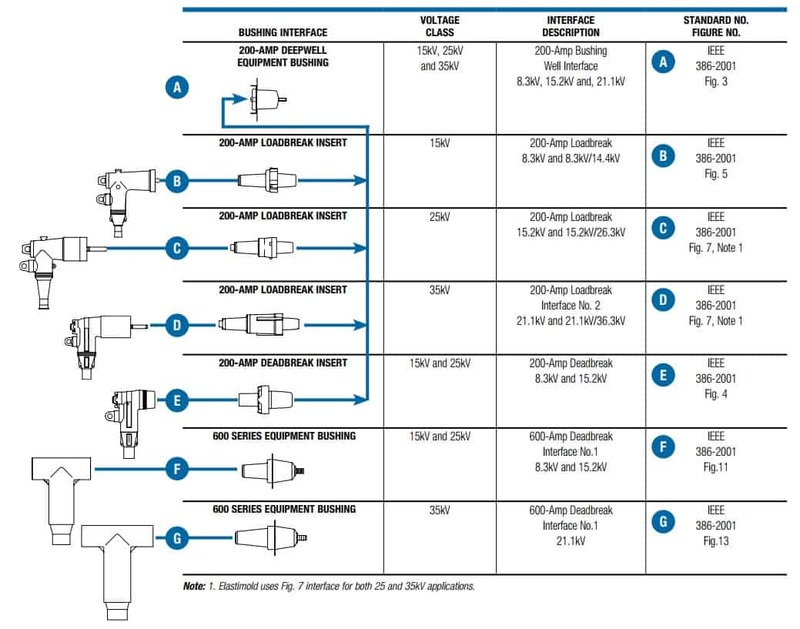 The following table shows voltage and current ratings which apply to all Separable Connectors including 200-Amp Loadbreak, 200-Amp Deadbreak and 600 Series Deadbreak products. * Designed for 90° C maximum continuous operating temperature. The below table shows switching and fault close ratings which only apply to 200-Amp Load-Break Connectors. IEEE Standard 386 defines the specific interface dimensions that 200 Amp and 600 Series elbows, inserts, junctions, equipment bushings and any mating components must conform to ensure interchangeability. The image below provides information concerning the types of interfaces supplied by Elastimold for various applications and is useful to ensure proper matching of components. T&D provide competitive prices and specification support for medium and high voltage loadbreak and deadbreak elbow connectors, manufactured by Elastimold, from extensive stocks to UK and international destinations. ➡ Should you require customer service or technical support please contact us – view the full range of Elastimold Elbows below.